With every afternoon climbing into the 90’s you need something quick and refreshing. Fill a pitcher with ice and water. Add thin slices from 1/2 of an English cucumber. Chill for an hour or two and you have a spa worthy sip. Make it in the morning and you’ll be ready when the mercury rises! 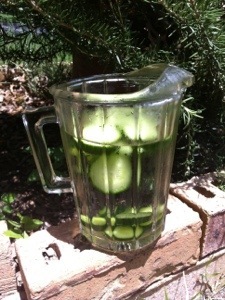 Check out my H2O Pinterest board, full of infused water ideas. « Great site for nutrition analysis!